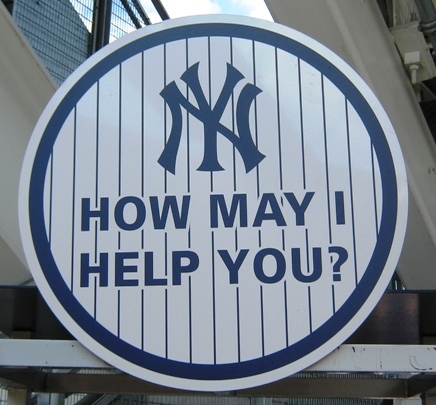 Elsewhere on this site I’ve already covered some Yankee Stadium food, like the amazing Lobel’s steak sandwich and the cheaper sandwiches you can get at the nearby Court Deli, so while those may be great options, you still have some other great choices in the Bronx ballpark. I am only holding this for one photo. Make it count. 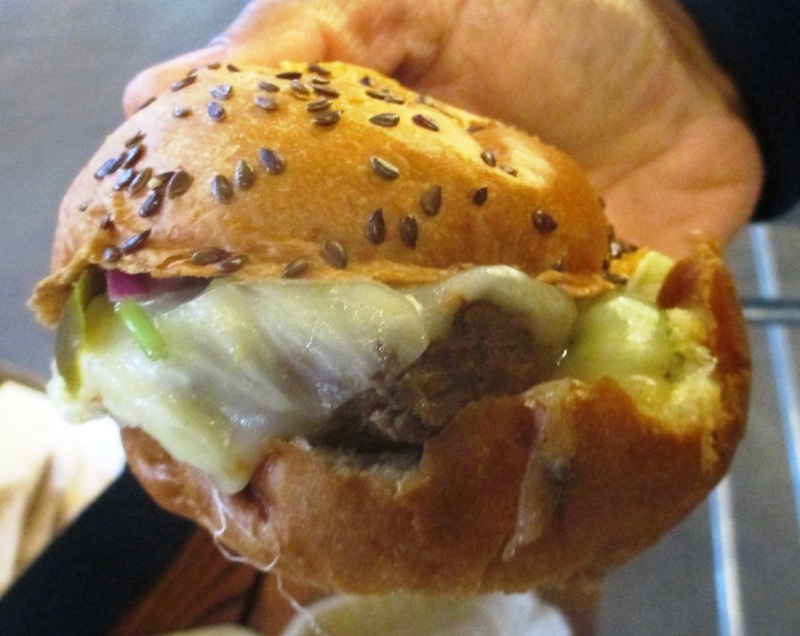 Yankee Stadium Food, Tip #1: The El Matador Burger. The Bareburger people have installed a stand at Yankee Stadium; Bareburger is a local chain that started in Queens and made grass fed beef burgers before it was cool. The El Matador is a bison burger (leaner beef, or so I’m told) topped with pepper jack cheese, jalapenos, pico de gallo and habanero mayo. That sounds like it would blow out the back of your brain, but as long as you can handle spicy food you should be fine; it’s manageable. If it’s too spicy they have regular burgers too, and they make a decent black bean veggie burger. Yankee Stadium Food, Tip #2: The Parm Meatball Sandwich. 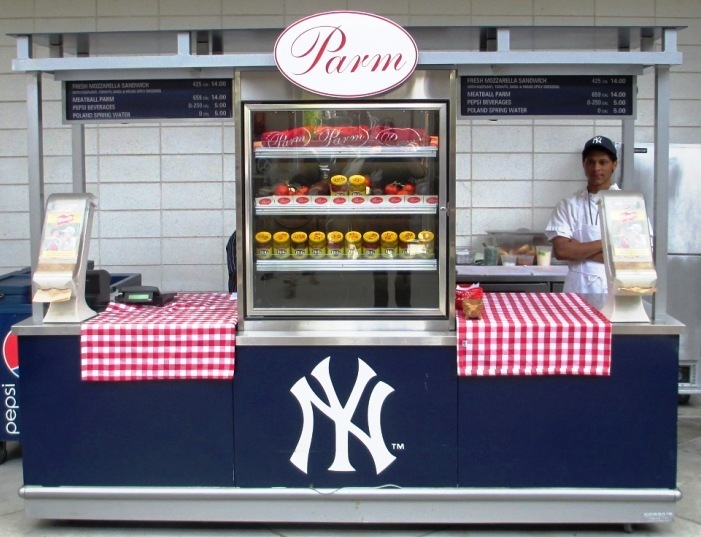 It’s easy to miss the Parm stand; it’s tucked away in the right field corner, but you’ll see it if you get in the long line for Monument Park. Parm is a Little Italy-based specialty foods shop run by some popular downtown chefs. They don’t have many offerings at the Stadium, but the ones they have are terrific, especially the meatball sandwich. It’s got lots of texture with a spicy tomato sauce and basil leaves on a seeded roll. Can be a bit messy but worth it. Parm is something of an unsung hero here, like Mama’s of Corona across town in Citi Field. But it gets high marks from people who try it. Their eggplant parm sandwich is popular with vegetarians too. Not recommended on a date unless you’re sharing. Yankee Stadium Food, Tip #3: Garlic Fries. They aren’t any particular brand of special potatoes, and by accounts that I’ve heard they’re not as good as the Gilroy garlic fries at AT&T in San Francisco. But if you’re not on a date and you like garlic, these are for you. 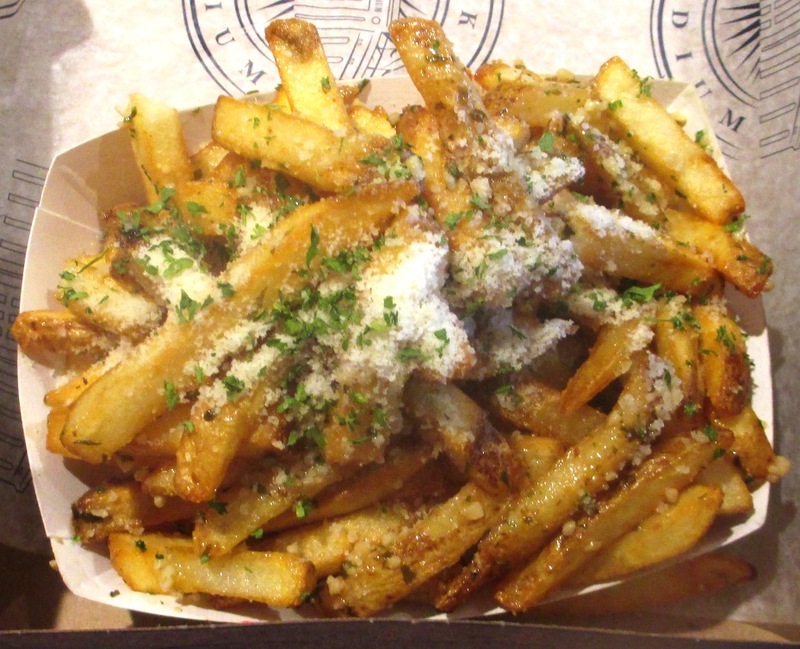 The garlic fries at Yankee Stadium are drowned in olive oil and covered with tiny little pieces of garlic…not garlic powder mind you but real minced garlic. You can smell them, believe me. Again, not recommended if you’re on a date, but they’re plenty tasty. The garlic fries are fairly expensive, so it’s better to get value with the larger version. You can get cheese on them if you want, but don’t get too conflicted in your flavor. There you go; three very worthwhile food items you can try in your next trip to the home of the 27-time World Champions. But there’s lots more, like the Mighty Quinn burnt ends sandwich, the Johnny Rockets cheeseburger, noodle bowls, party nachos, the list goes on…stay tuned.